(Clearwisdom.net) March 16 -- Geneva - The 2003 European Falun Dafa Experience Sharing Conference was successfully held in the beautiful city of Geneva, Switzerland. Over one thousands Dafa practitioners representing practitioners from over 40 countries gathered in Geneva to share their experiences in cultivating Falun Dafa and exposing Jiang regime's persecution of Falun Gong. In their opening remarks, Falun Gong practitioners reviewed the progress since the first European Fa-conference in 1998 and experiences gained through the last three and half years' against persecution activities. They also expressed their wholehearted thanks to those people, government officials and human rights organizations around the world that support Falun Gong. The first practitioner that came to the stage to give a paper was Martin from Poland. After he saw someone introducing that Falun Gong was a good cultivation way on an internet voice chatroom in 1999 after Jiang regime started persecuting Falun Gong, he downloaded Zhuan Falun from the internet and start practicing Falun Gong. Through his personal experience he felt that eradicating Jiang regime's lies was extremely important and he has been positively participating in various activities opposing the persecution. The second speech was given by Israel's Tanya. She was originally from Russia. Before she started practicing Falun Gong, she had cancer and many of her organs were removed. When she was critically ill, a nurse introduced Falun Gong to her. Since then it was as if she had found a treasure. After she started practicing Falun Gong her cancer was cured. But another cancer patient who shared the same ward with her died soon after. Tanya had been to Beijing's Tiananmen Square by herself to appeal to stop the persecution of Falun Gong practitioners who just follow the principle of "Truth-Compassion-Tolerance" and tell people Falun Gong is good. She said, "Nobody can stop me." She introduced Falun Dafa to a small town in Israel. Many Chinese she met in a restaurant soon understood that Falun Gong is truly good. Ms. Gulli was born in Iran. She had a rough life before she began practicing Falun Gong. She was abandoned when she was 13 by her parents so she left Iran for Sweden. She felt Falun Gong was wonderful so she translated the books Zhuan Falun and Falun Gong into Iranian. The books are distributed all over Iran with authorization of the Iranian government. 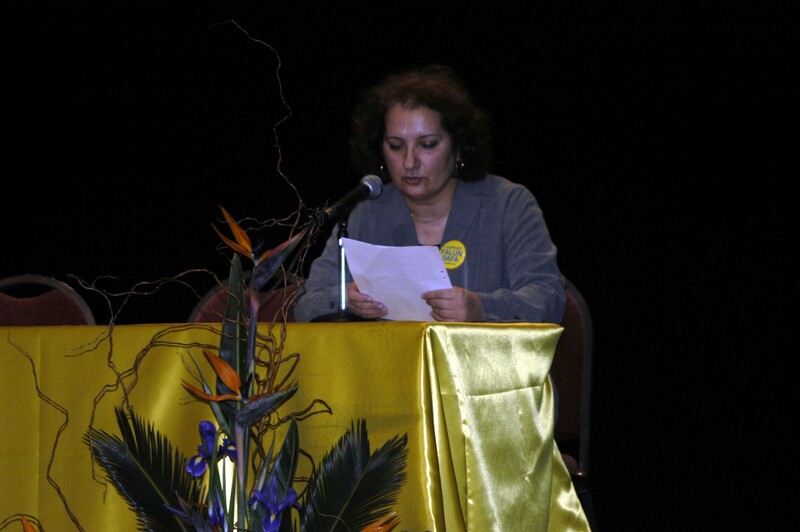 She stayed in Iran for half a year to voluntarily teach Falun Gong and established practice sites in many parks. Now many areas in Iran have people practicing Falun Gong. 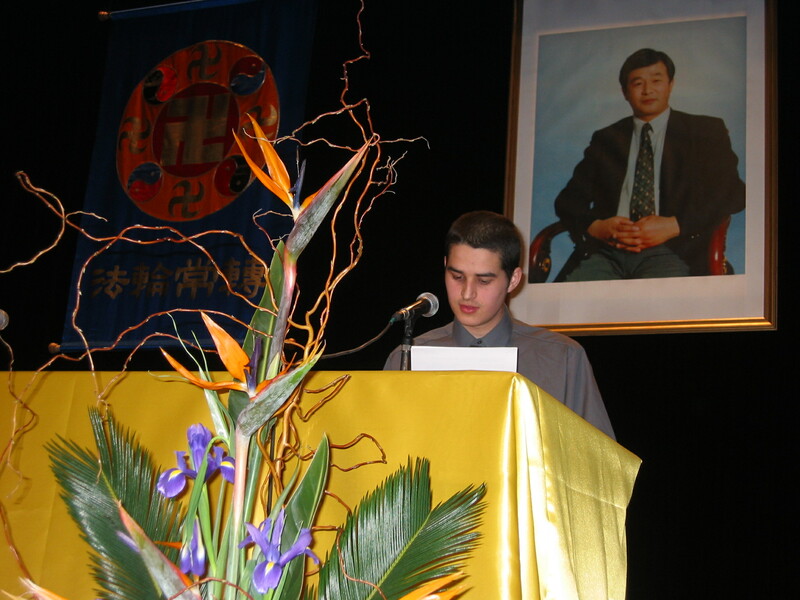 Carlos Iglesias was a young lawyer from Spain who had just started practicing Falun Gong two months ago. He was very weak before he practiced Falun Gong and had had two operations. Two months ago he learned of Falun Gong at a health expo. Falun Gong answered many of his lifelong riddles. He could not understand why such a wonderful cultivation practice could be persecuted by the Chinese government. He was regretful that he obtained the Fa so late. He said he was willing to use his whole life to cultivate Dafa. He appealed to the international society to help stop suppressing such a wonderful exercise. Practitioner Dana from Romania also shared her experience. Dana obtained Dafa in July 2001. She narrated how she overcame many difficulties to appeal for Falun Gong by herself in front of the Chinese Embassy. Zhao Rong from Germany narrated how he eliminate attachments to fame and fortune during a busy scientific paper writing period and did his job well and finally graduated with outstanding grades. Katherine from Switzerland shared her experience in making phone calls to China to clarify the truth with compassion. She overcame language barriers and asked practitioners to translate her letter to Chinese people into Chinese and then personally transcribed the letter with sincerity and sent it to Chinese people. She also talked about how to adjust her relationship with her husband and son to make her family more happy and peaceful. Ms. Wang Xianghe from Holland held her brother's photograph and told a vivid testimony of the persecution several family members had suffered. Jane Dai who had testified at a forum on persecuted women during the last March's UN World Human Right Convention once again came to Geneva with her daughter. She will tell more people the experience of brutal persecution her family had suffered and her husband's death due to the Chinese police's brutality. 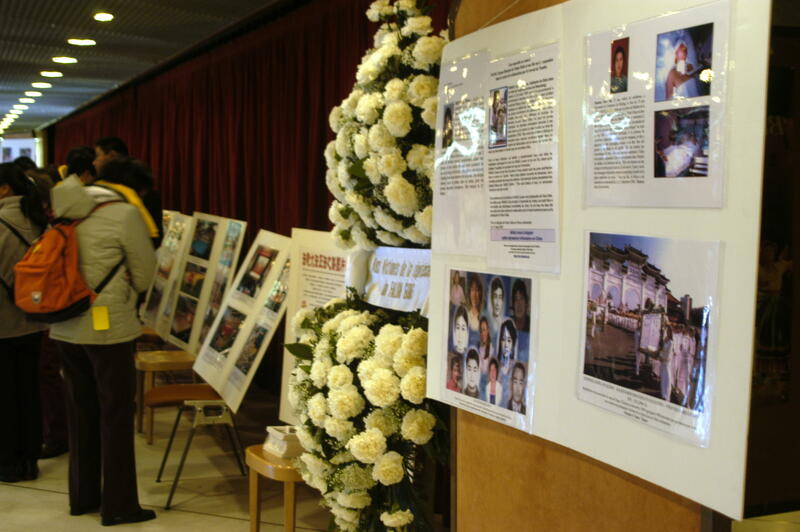 In order to appeal to China to stop the persecution, every year practitioners from all corners of the world gather in Geneva to appeal to the United Nations and various countries' governments and non-government organizations since 2000. This year is the fourth year. Since March of 2000, every appeal in front of UN starts with a daylong experience sharing conference. I want to give a speech too!